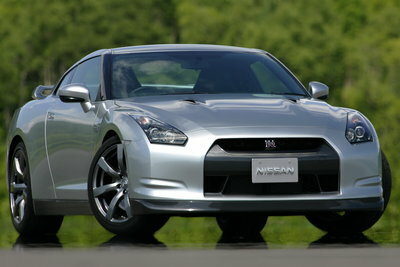 A legend among Japanese supercars, Nissan's GT-R finally made it to the US in 2008. Powered by a twin-turbo 3.8L V-6 coupled to a 6-speed dual-clutch transaxle, the all-wheel drive GT-R is one of the highest performance sport coupes available at any price. Each 480-bhp/430 lb.-ft. VR38DETT engine is assembled by hand at Nissan's Yokohama engine plant. The latest iteration of the ATTESA E-TS all-wheel drive system varies torque-split from the normal 0:100 to 50:50 (F/R) as road and driving conditions require. Bilstein provides the driver-adjustable DampTronic system with three damper settings: Normal, Comfort and "R" (ultimate handling). Nissan's VDC stability control system and transmission shift mode also have three settings controlled by the driver. Brembo 15-inch diameter disc brakes are at all four wheels, with 6-piston calipers in front and 4-piston calipers at the rear. Dedicated Bridgestone run-flat tires on forged 20-inch alloy wheels are standard: 255/ZRF20 (front) and 285/35ZRF20 (rear). In the cockpit, a complex multi-function display tracks all mechanical and electronic subsystems of the GT-R, and can record vehicle performance data for review. Options include an 11-speaker Bose audio system, hard disk entertainment system, and Bluetooth phone capability. Nissan also offers a special hand-polished 7-coat silver paint that is baked five times for enhanced gloss and durability.